We are a biodiversity team, however our primary focus is currently rowi kiwi recovery. Rowi are critically endangered with an estimated population of around 4-500, confined to Okarito forest in South Westland. 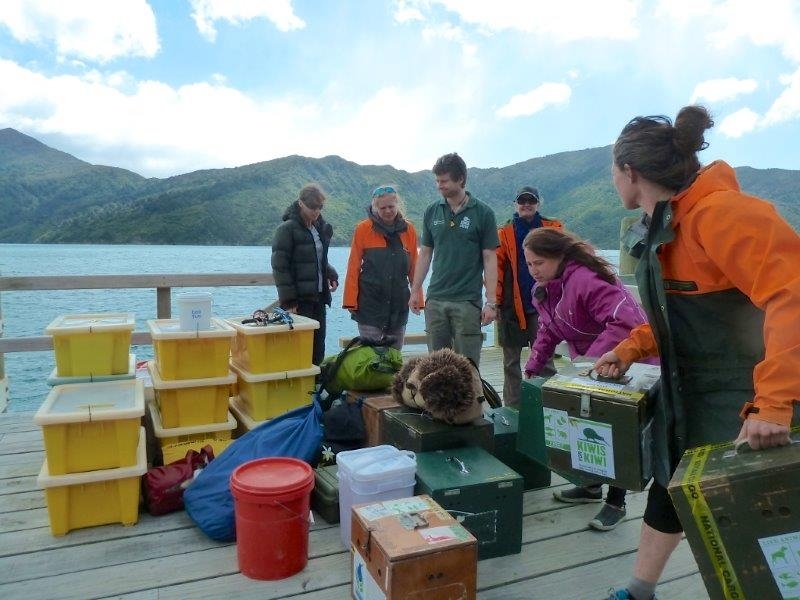 We intensively manage their recovery through Operation Nest Egg, whereby eggs are taken from monitored pairs and incubated at the West Coast Wildlife Centre in Franz Josef. Chicks are then flown with Air New Zealand to Willowbank Wildlife Reserve in Christchurch. Here they spend time learning to feed independently and becoming a little less naïve to the outside world. They are then transferred to our pest-free crèche island, Motuara, in the Marlborough Sounds, where they spend about a year before being brought back to Okarito forest for release. We currently monitor 70 breeding pairs, visiting each bird once a year for a health check. Each nest is visited to collect the egg, and once the chick hatches and is transferred to Motuara Island it is visited every six weeks for a health check and to change its transmitter as it grows. We currently have close to 60 chicks from the 2014/15 breeding season, which will be released back into Okarito forest in October, making room for this years chicks. How does this help DOC achieve our goals? The programme has been hugely successful at bringing rowi back from the brink, with a low of around 150-200 individuals in the nineties to a current population of around 500. The future is now looking a lot brighter for this species. We work closely with local iwi Makaawhio to help them practise their responsibilities as kaitiaki. The fact that most people will go about their lives without ever getting a chance to see a kiwi and that future generations may not ever get that chance is a huge incentive for us in the work we do. 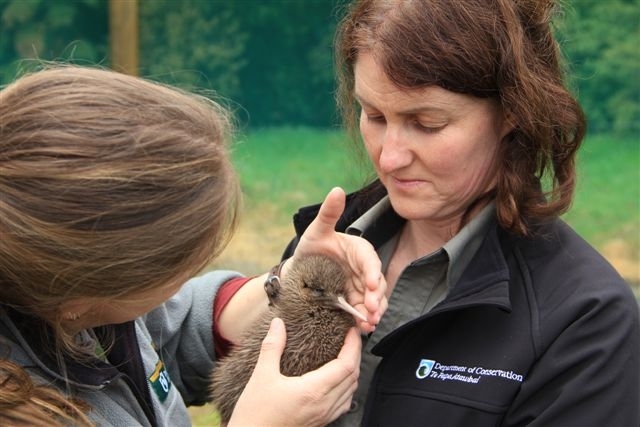 We provide opportunities for individuals to connect with kiwi and get involved in conservation through school visits and public events. Our team is comprised of Jo MacPherson, the Operations Manager; Lyndon Slater who fills the Senior Ranger role is fresh to the team as of last week; and three predominantly field based rangers – Iain Graham, who mostly works with the crèche island sites, Tracey Dearlove, who manages our database and does a bit of everything when it comes to fieldwork, and Kath Morris who mostly works in Okarito forest. We normally have two Waikato University students who join us for a six month internship placement over the busy season. Last year’s student, Kristy Owens, is still with us and is now a fully fledged ranger doing solo egg rescues and health checks. We offer long term volunteer opportunities and currently have two in the team: Anya Kruszewski from the UK and Daniel Gaulin from the USA. What guides you in your work? Kiwi best practice and local best practice manuals and the Kiwi Recovery Group. What is the hardest part about your team’s work? Not having the ability to save them all. A huge amount of effort goes into each individual, but despite this rowi still get hit on the roads. Most recently a rowi was hit on North Okarito road only four months after its release – it was otherwise in great health. Managing diseases in such an intense breeding programme is also a real challenge – we never know what curve balls will be thrown at us and there are a lot of unanswered questions. This is a big mix of things, but for most of us one of the best moments is seeing people’s faces when they see a kiwi in real life for the first time. The smiles, laughs and sometimes tears are pretty priceless and we feel hugely privileged to be able to give people this opportunity to connect with our national icon. Knowing that we are actively helping to conserve a species in such trouble is hugely rewarding. And, of course we get to spend our days in one of the most beautiful places in the world. What is one interesting fact about each team member? Jo Macpherson is related to Robbie Burns, being a direct descendent of his brother. Kath Morris was born on the West Coast (of Canada)! Tracey Dearlove recently went on ‘holiday’ to Nepal, landing in the country half an hour before the big 7.8 quake hit. Not surprising her holiday was a little different to what she’d anticipated. Lyndon Slater had a previous life as a gamekeeper in Scotland, entertaining the lords and ladies and whacking moles on the head. Heath Sinclair grew up on a farm in mighty Pukekoe where a local population of bats exist. His family now carry out pest control to help the bats and other species that reside there. Rein is one clever dog (so she gets three interesting facts!). 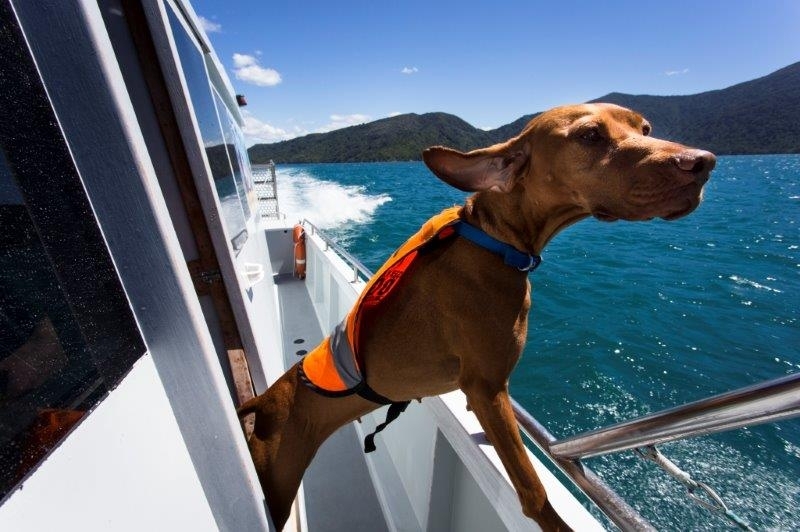 She not only finds kiwi but has been known to find radios, hammers and other items lost in the bush upon request. She has helped find over 1000 kiwi in her career and continues to amaze us all with her tracking skills. 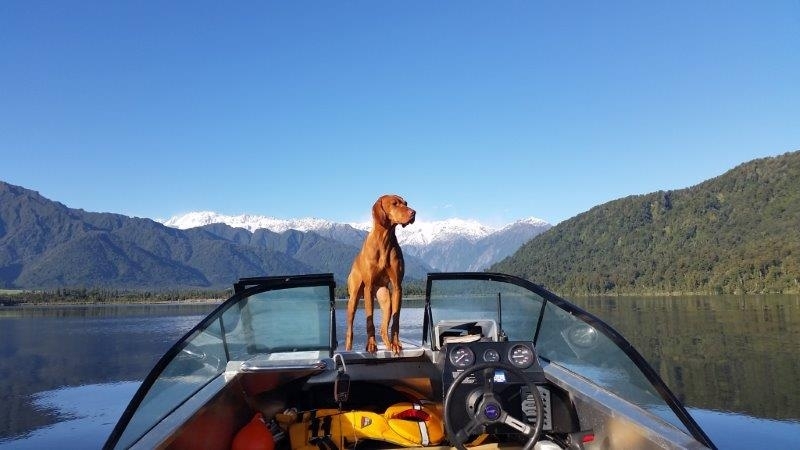 Rein also manages her own Instagram account @gingerdogwithajob where she updates the masses on all things kiwi amongst her own adventures. All without opposable thumbs! What are your team’s favourite things? Kiwi threesomes – when a mission in for one egg becomes two due to a sneaky male kiwi with two special ladies. We currently have four known threesomes in Okarito sanctuary. ‘Jackpot’ burrows. On our crèche island, Motuara, the birds are still young so are very social and sometimes congregate together in burrows during the day (sometimes up to 10 in one hole). The view from Three Mile beach on a clear day is unbeatable – looking from the ruggedly beautiful coast up through towering Rimu stands to the picturesque spine of the Southern Alps. Amazing technology that has hugely changed the way we operate. Volunteers – we have an amazing amount of dedicated volunteers who join our team and the work we do wouldn’t be achievable without them. Currently have a student from Waikato University, Kristy Owens, who joined us for an internship placement and has now been here almost a year! The morning commute into Okarito Forest. What are your team’s pet peeves? Claggy weather when we really want to fly! No signals on kiwi transmitters – these cause a few headaches, especially when a bird (usually a young one) goes for a wander outside where it is normally found or when a transmitter fails. Fortunately we have Skyranger which allows us to search for signals by air, cutting down ground searching time enormously. Giant areas of tree fall – after cyclone Ita some areas of the forest we work in are pretty hard going – especially when you have a fragile egg to carry through them! Hook grass – this applies to Rein who shows amazing agility in trying to avoid these plants whenever she encounters them. Supplejack tangles – most of us have a love-hate relationship with supplejack. October is Save Kiwi Month, Kiwis for kiwi’s national campaign to raise awareness of the plight of kiwi. Learn more about our work with kiwi on the DOC website. Great article. These guys all do an amazing job. Rein is adorable!